Source: Kar­ma, Tõnu. (Tenu Kar­ma) “Lībieši.” Kurze­me un Kurzem­nieki. Ed. A. Vītols. Rīga: Latvi­jas Encik­lopēdi­ja, 1995. 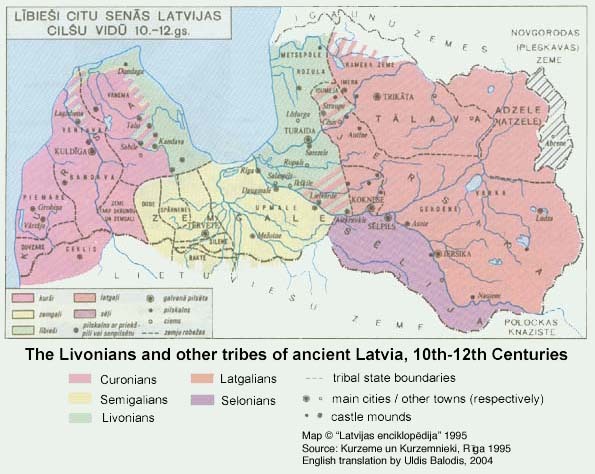 The Livo­ni­ans are a Finnic nation native to Latvia. His­tor­i­cal­ly, they have inhab­it­ed a region of vary­ing extent along the coasts of the Baltic Sea and Gulf of Rīga in Latvia and even deep­er into Latvia along the Dau­gava River. 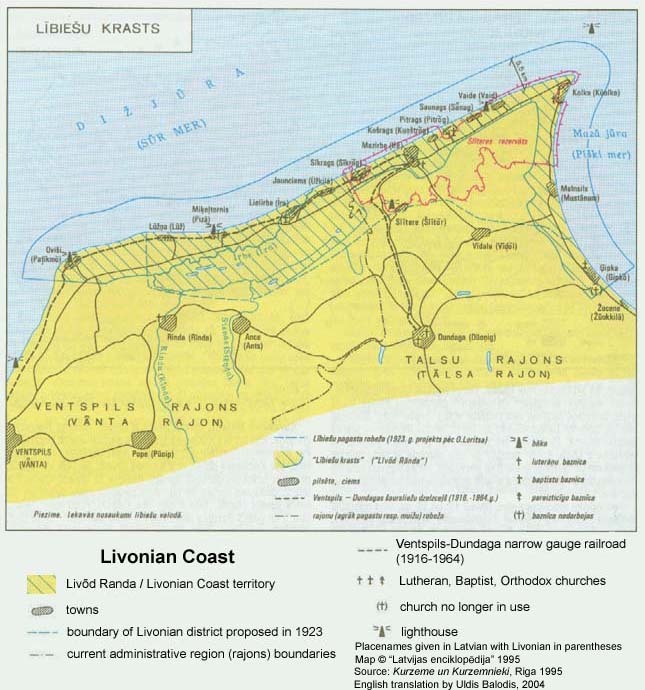 With the pas­sage of time, the region in which Livo­ni­an was spo­ken con­tin­ued to shrink. By approx­i­mate­ly the 1860s, Livo­ni­an ceased to be spo­ken on the east­ern shore of the Gulf of Rīga (the last known speak­ers of Livo­ni­an in this region lived near the town of Svēt­ciems). In the 20th cen­tu­ry, pri­or to WWII, the Livo­ni­ans lived in a string of vil­lages in north­ern Kurze­me in extreme north­west­ern Latvia. Dur­ing this time Livo­ni­an was still a lan­guage used in dai­ly life by mem­bers of all gen­er­a­tions. The term “Livo­nia” is con­fus­ing in Eng­lish, as it refers to a region and his­tor­i­cal admin­is­tra­tive unit, which is not specif­i­cal­ly relat­ed to the Livo­ni­ans. (The Wikipedia arti­cle on this his­tor­i­cal “Livo­nia” gives a fair­ly good overview of its his­to­ry.) The term “Livo­nia” is also used in the name of this web­site as a con­ve­nient way to talk about the place where the Livo­ni­ans live; how­ev­er, in gen­er­al “Livo­nia” is not used in Eng­lish to refer to the Livo­ni­ans’ home­land. Dur­ing the Sovi­et occu­pa­tion of Latvia fol­low­ing WWII, the coast his­tor­i­cal­ly inhab­it­ed by the Livo­ni­ans was mil­i­ta­rized by the Sovi­ets, which made it dif­fi­cult for civil­ians to live in this area. As a result most Livo­ni­ans ulti­mate­ly left their ances­tral vil­lages and moved to larg­er cities includ­ing Rīga and Kolka. Dur­ing WWII, some Livo­ni­ans also fled Latvia and end­ed up liv­ing as part of the Lat­vian refugee com­mu­ni­ty in var­i­ous West­ern coun­tries, includ­ing Swe­den, the Unit­ed States, Canada, and else­where. The last known native speak­er of Livo­ni­an, Grizel­da Kris­tiņa, was a mem­ber of this com­mu­ni­ty and lived near Toron­to, Canada until her pass­ing in 2013. The Livo­ni­ans have nev­er had a state or region of their own in mod­ern times. Dur­ing the pre-WWII inde­pen­dence of Latvia, the Livo­ni­ans became more orga­nized and worked to secure a role for their lan­guage in their com­mu­ni­ties with the pub­li­ca­tion of the Livo­ni­an-lan­guage news­pa­per “Līvli”, the hold­ing of reli­gious ser­vices in Livo­ni­an on the Livo­ni­an Coast, and the teach­ing of Livo­ni­an in vil­lage schools to a lim­it­ed extent. Dur­ing this same time, the Livo­ni­ans peti­tioned the Lat­vian gov­ern­ment for the cre­ation of their own Livo­ni­an admin­is­tra­tive region, which would encom­pass all of their vil­lages. This was ulti­mate­ly unsuc­cess­ful. Fol­low­ing the Sovi­et occu­pa­tion, with the mil­i­ta­riza­tion of the Livo­ni­an native region, no fur­ther move­ment on such a project was pos­si­ble. Between 1990 and 1991, Latvia suc­cess­ful­ly reestab­lished its pre-WWII inde­pen­dence. 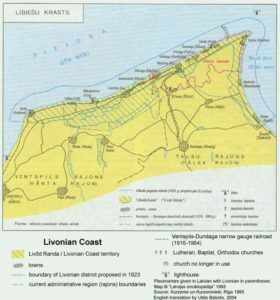 On Feb­ru­ary 4, 1991, a spe­cial ter­ri­to­ry named “Līvõd Rān­da” (“Livo­ni­an Coast”, in Livo­ni­an) was cre­at­ed with the intent of work­ing to pre­serve, pro­tect, and renew the Livo­ni­an cul­tur­al and lin­guis­tic iden­ti­ty of the coast. This ter­ri­to­ry exist­ed until 2003. Since that time and up until the present (as of 2017), there has not exist­ed and does not exist any specif­i­cal­ly Livo­ni­an ter­ri­to­ri­al unit in Latvia, nor are there any plans for the cre­ation of such a unit.